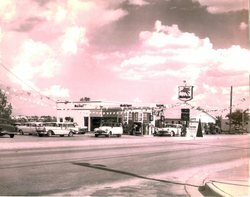 This is a photo of the Mobil Gas Station that used to be next to Home lumber and accross from where Amy’s Ice Cream is now on Burnet Road. The picture was taken at the stations’s grand opening in June 1956. It closed in 1985. I spoke with David C. Wallace, the owner. He said he bought the station from Magnolia Petroleum after moving here from Waco. operated a number of gas stations around Texas and neighboring states.